We owe our lives to our mothers. Granted, we also owe them to our fathers, and most especially to God. But a lot of times we gloss over the fact that, for somewhere around nine months, we shared a body with someone else. Every single thing they did affected us, much like every single thing we did affected them. We could make them throw up. They could make us wiggle around. We could make them completely and utterly uncomfortable no matter what they tried. They could nourish us or destroy us by what they consumed. Motherhood is a magical thing. Something else that I find magical about it is the ability of women who have never given birth to be innate mothers when, oftentimes, birth mothers aren't cut out to be. I have three very different children -- different interests, talents, abilities -- that are each incredible in their own way, and I love them more dearly than I can possibly express. I didn't give birth to any of them, but that doesn't affect the way I feel about them one bit. They are mine, and they will always be loved, unconditionally, non-judgmentally, forever by me. 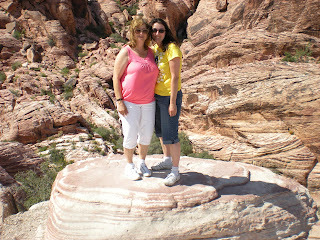 This picture is of my mom and myself at Red Rock Canyon in Nevada. Traditionally, my mother has always been afraid of flying and afraid of heights, so the fact that she flew out to Las Vegas with me and took a picture on a rock where it appears we're about to fall off the edge of the world says great things about the lengths a mother is willing to go for her children. This picture speaks volumes, if you read enough into it. Her strong desire to travel, her obvious ability to overcome fears, her health, her complete lack of looking her age... you can see all of these things if you look closely enough. Such are the things that we take for granted in people all the time. We set aside one day a year to honor our mother, or our father, or grandparents, or our Valentine... but who looks into the soul of these people every day, every minute of their lives? He knows what's on our hearts at any given moment, and He's ready and waiting to share in it with us. He's full of unconditional, parental love for each of us as individuals, with our different interests, talents, and abilities. He accepts us when we've made mistakes, He comforts us in our greatest moments of heartache, and He gives us the strong will and strength of spirit -- His Spirit -- to move on and live to do the right thing another day. For any woman who has shown love to a child, this is your day -- but so is everyday. You should be blessed and praised not just once a year, but all year long. To those mothers lucky enough to have given birth, yes -- but to stepmothers, adoptive mothers, foster mothers, grandmothers who have taken a hand in raising their grandchildren, and anyone else who has assumed the responsibility of a mother -- thank you. Thank you for the love you have in your heart. Thank you for the sacrifices you have made. Thank you for changing and shaping the life of a child, forever.